What is the key to unleashing an economic boom in Africa? 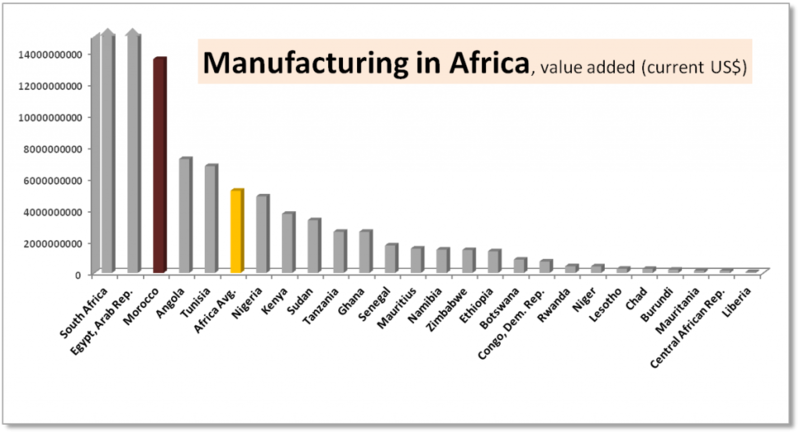 A recent article in The Economist argued that the main avenue to growth on the continent will be a significant expansion in manufacturing. Morocco is already a leader in African manufacturing and continues to position itself to take advantage of maturing African markets by fostering a diverse array of industries with significant growth potential. Morocco’s efforts to promote manufacturing and attract Foreign Direct Investment have already begun to pay dividends. The country has made headlines in recent years by drawing in big manufacturing contracts with automotive, aeronautic, and retail companies from Europe and North America, and importantly, building industry ecosystems (such as Casablanca Technopark) around them. Morocco looks set to build on these gains, as an increasingly attractive destination for what the World Bank estimates to be 80 million jobs that may soon be leaving China. But Morocco has also become a major investor itself in markets on the African continent. The Moroccan King’s ongoing “working visit” to Mali, Guinea, Cote d’Ivoire, and Gabon to improve political and economic ties in West Africa notably includes a delegation of leaders from more than 100 Moroccan businesses. This “increasingly prominent role that Moroccan firms play across Africa,” according to the Atlantic Council’s Dr. Peter J. Pham, includes manufacturing, banking, agriculture, telecommunication, and pharmaceutical sectors. These are industries that will thrive as African economies continue to mature. Morocco’s Attijariwafa Bank was one of the first companies to see value in offering banking services to those in Africa who previously didn’t have any — now the bank has 367 branches in eight Sub-Saharan African countries. Morocco is diversifying its economy and its trading partners, facilitating bigger and better projects with businesses from Europe and the US, working to build new trade links in West Africa, and holding out hope that North Africa can overcome political obstacles to increase regional trade. If Africa is indeed “an awakening giant,” you can expect Morocco to play a leading role.